Heat oven to 375°F. Separate dough into 4 rectangles. Onto ungreased cookie sheet, place 2 rectangles, short ends together, forming 14x5-inch rectangle. Firmly press perforations and center seam to seal. Spread rectangle with dressing to within 1/4 inch of edges. 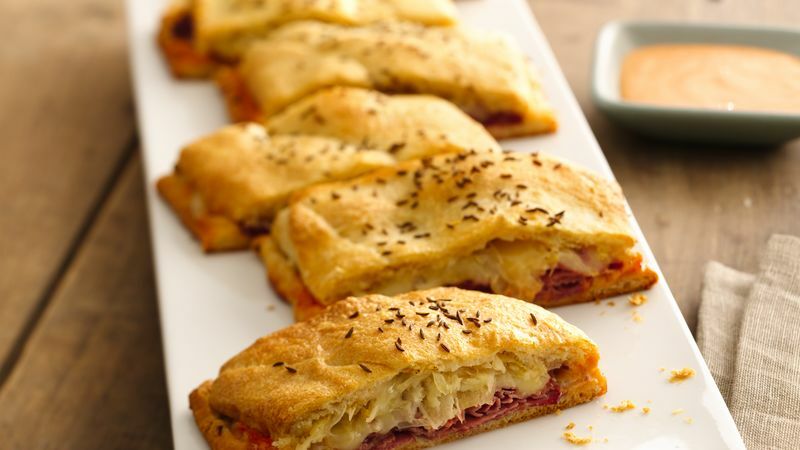 Top with corned beef, cheese and sauerkraut. Press remaining 2 rectangles to 7x5 inches, firmly pressing perforations to seal. Spread each with 2 teaspoons mustard. Place each rectangle mustard-side down on sauerkraut, pinching center seam to seal. Brush top with water, and sprinkle with caraway seed. Bake 18 to 22 minutes or until deep golden brown. Cut into slices. Serve warm. To make 4 individual hand pies: Separate dough into 4 rectangles. Place on ungreased cookie sheet. Press each to 7x5-inch rectangle, firmly pressing perforations to seal. Fill as directed in step 2. Bring ends up over filling, overlapping about 1 inch. Press edges with fork to seal. Brush with water, and sprinkle with caraway seed. Bake 13 to 15 minutes or until golden brown.